Right, I have got very, very, very behind with this yearly project! I didn’t forget my idea to bake 52 things in 2013, but I did forget all about counting and cataloging them. It’s now December and I have made the first batch of mince pies for this Christmas which reminded me to go back and tot up the score. I was on 27/52 by the end of May. 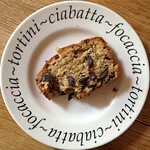 A way to use up the overripe bananas, with some chocolate that obviously needed using up too, honest, thrown in. 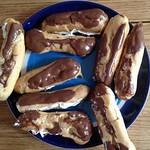 I have made choux pastry once before, at least a decade ago, so thought it was about time for another go. They were fine. I just came to the conclusion that ‘cream cakes’, as much loved a treat as they are, really aren’t my favourite kind of thing. 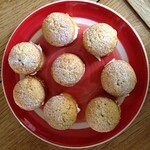 Mini Victoria Sponges I got the baking tray for these from Lakeland, and used their sponge recipe too. I filled them with homemade peach & vanilla jam and they were super yummy. Much more my thing than eclairs. That’s 30/52, well on target. But at about this time I started experimenting with jam making which took some of my baking energy away. The jam making deserves a post of its own at some point.